The technological revolution sweeping Bangladesh has brought about a significant amount of progress. Across sectors, industries are witnessing exponential growth, resulting in an increased demand for power. The power sector is finding it increasingly difficult to alongside of the demand, hence, power is at a premium. Power utilities are imposing stiff penalties on industries that cause power wastage. The way out is improving power efficiency. That is just what we at Rafin Corporation Ltd. excel at. We are experts in improving power factor computation,distortion and efficient reactive power management. We formally introducing in 2000 , Rafin Corporation is one of the fast growing company in Bangladesh . We do engineering , procurement & construction . We manufacturing all electrical equipments like HT, LT switchgear , PFI plant , Transformer , Erection and commissioning of electrical Sub-Station & Generator. We supply Street solar light, LED, CFL, Droup out Fuse , Lightning Arrestor , Circuit breaker , High transmission line HT , LT cable & Transformer . We are first class Government contactor Like Dhaka WASA, PWD, Road & High way , LGED, Radio Bangladesh, BTCL, BPDB, DPDC, PGCP, DESCO, Bangladesh Railway & City corporation. We are doing Export & Import business . Rafin Corporation is really challenging Organization that met up 21 century standard . The Mission : Our Main motto is quality and completion the project within the time frame . Our goal is to serve people to serve the country on time every time . Competitive pricing, uncompromised quality and timely delivery have helped us develop a strong reputation amongst a discerning clientele, which includes cement plants, textile mills, steel plants, petrochemical plants, chemical plants, power utilities, etc. Our products match up to the most stringent testing standards and are recommended by the foremost consultants in Bangladesh. 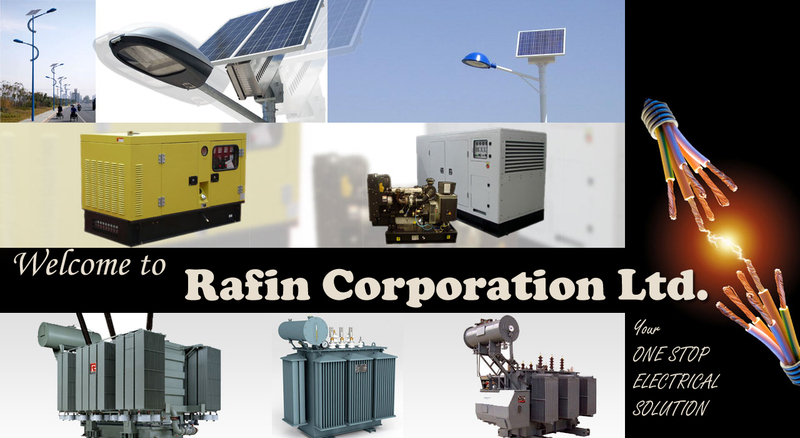 Rafin Corporation can supply your complete requirement of power factor improvement systems, with accessories like switchgears, relays, control panels, reactors, Street solar light, LED, CFL, Droup out Fuse , Lightning Arrestor , Circuit breaker etc.